Love this shirt and I love how it’s not in your face Star Trek. I feel like I’m part of the Discovery crew when I’m wearing this shirt. Only true Star Trek fans know when they see this shirt and I have already received compliments on it. Fits and looks great. Size was spot on. Has kept color and size after several washings. Would recommend. Couldn't of been happier once i opened it. Material is very soft and true to size. Looking forward to wearing it at this years Pax East. Great shirt. The material is soft. Fits true to size. Graphics are very well done. When I wear this shirt, I don’t just go out. I BOLDLY go out! My wife and I are loyal Star Trek: Discovery fans and the t-shirt fits her perfectly! I love the stealthy DISCO design... only fans recognize it! Great shirt, fits as expected. Do you love Discovery? Then wear this shirts and show ‘em all that you’re a fan! My friend loved the shirt. Fits great. I was able to track my purch right to the doorstep and the ordering process is amazingly easy!! Thanks. This is a high quality t-shirt that fits true to size. 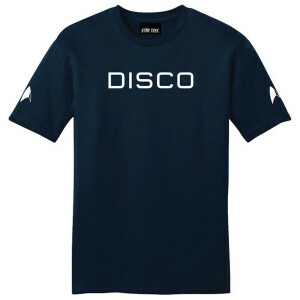 The only thing I was a little surprised about is that the Disco logo seemed tiny bit small to the ratio of the shirt. However, this wouldn’t stop me from buying it again. Very nice quality shirt and printing. Don't take a chance on getting a cheap knockoff - buy from the Star Trek store. I love this shirt! I bought it first on Amazon and I'm pretty sure it was fake as the DISCO logo was tiny and crooked. This one looks perfect and exactly like in the show. Met Captain Lorca while wearing this at a con, and he said he had shirt envy! No one who has not seen the series gets it, and just thinks it has something to do with music tastes, it’s great. As for the fabric, it’s a soft T-shirt, and doesn’t show what you wear underneath. The screen printing has lasted many washes.